While I grew up in aprons, standing on wooden stools by the stove top at the hands of two of the best cooks I’ve ever know, we weren’t always known for branching out. Mama and Grandma made what they made, and you’d best believe whatever was set on that supper table was gonna be the best version of <enter recipe name here>, but we mostly rotated meals in a two month cycle. Other than the holidays where we pulled out all the stops and whipped up the more extravagant family favorites. Ya know, the dishes that even when they included veggies- it was still full fat everything, and grocery lists called for copious amounts of heavy cream. I was spoon fed on Southern comfort food, despite having a New Yorker grandmother because she’d married a Georgia boy and adapted. Fast forward 20 years and I meet my very Italian husband, have a whirlwind romance (ironically very mirroring such polar opposite grandparents) and am engaged three months later. While my FIL is full blooded Italian, and only a second generation child of immigrants- my MIL is half Italian and half Polish. Yes, I know the Hubs isn’t fully Italian because of this, it’s just easier to call him that since for the most part those are the traditions that carried over. All this to say, that while my MIL also adapted to her Husbands taste buds, she also managed to pass down some of her Mothers tried and true family recipes. 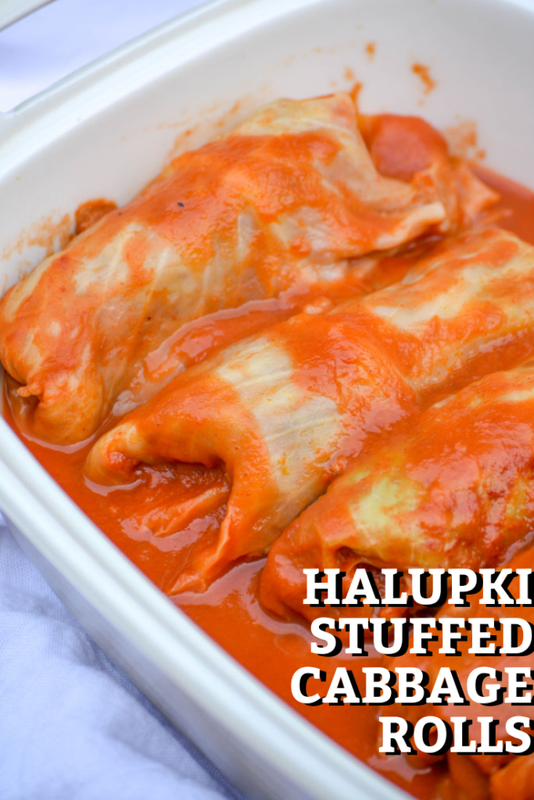 I’d never heard of stuffed cabbage rolls, let alone anything called Halupki, before that first Thanksgiving. It was placed squarely in the center of the table along with that juicy, brined and roasted turkey. I hate to admit it now, but at that time in my life- I wasn’t exactly a picky eater, but I was a firmly stay in your lane kind of eater. Never had cabbage before, knew I didn’t like cabbage, and that was all she wrote. Until my husband gave me the droll stare that said, “Really? I just scarfed down green bean casserole, pecan pie, and everything pumpkin related under the sun at lunch with your family. And you won’t even try a single bite of my mother’s halubki?” It was a very loaded look. So, of course I sheepishly scooped a stuffed cabbage roll onto my plate. Almost 13 years later, and am I ever so glad that I not only noticed the look, but also gave it a try. They’re amazing! Ever heard of stuffed peppers? Love the filling, but could take or leave the roasted pepper? Then this is the dish for you. Even if you’re on the fence about cabbage- this dish will consider the vegetable signed, sealed, delivered, it’s yours- or at least on your regular menu from now on. One bite’s all it takes. 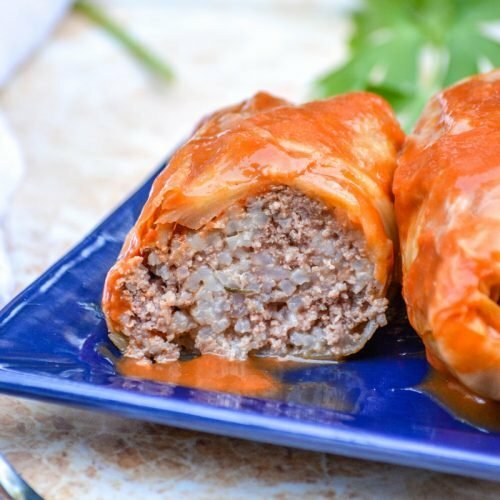 It’s actually a very popular Eastern European dish, which encompasses many different cultures, all with slight variants on the name. One thing that remains the same? They all essentially mean ‘little doves’ in their native tongue. 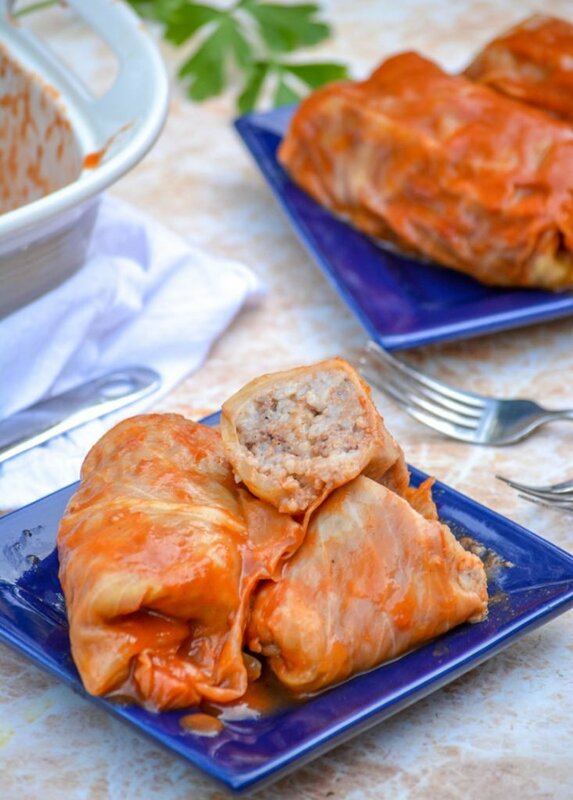 Believe it or not, Stuffed Cabbage Rolls are incredibly easy to make. You start by rinsing and coring a plump cabbage. You don’t want to cut too much though and then have all your leaves fall apart. That’s the hardest part, and if you’re unsure I recommend watching a YouTube video or two to see it in action. The cabbage is then boiled for 8-10 minutes, just long enough to make the leaves soft and pliable, but still sturdy enough for filling and rolling. A hearty mixture of a combination of ground beef & sausage, cooked jasmine rice, minced onion, and beaten eggs is kneaded and mixed together with a variety of simple, flavorful seasonings. 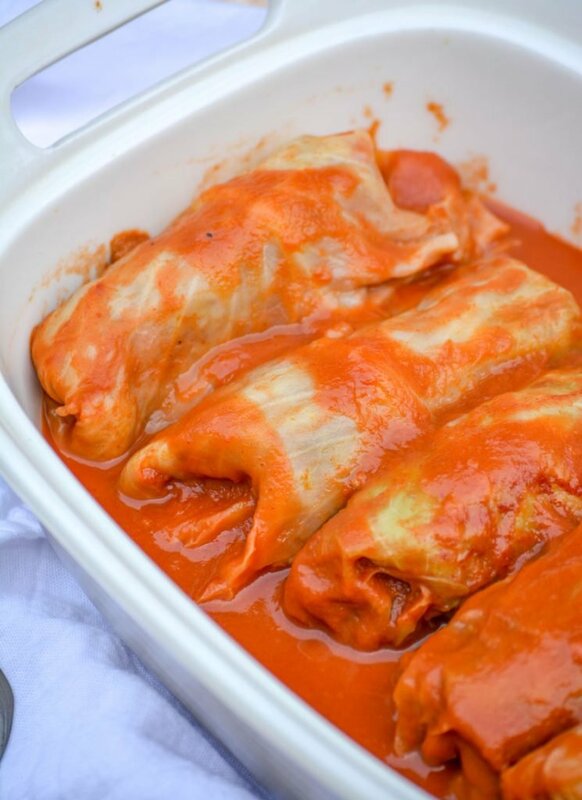 This mixture is then divided evenly amongst the cabbage leaves, which are tucked and rolled, and placed seam side down into a casserole dish prepared with tomato soup. Topped with more tomatoes soup, the dish is then covered, and baked for 40 minutes at 350 degrees. We tend to make ours on the larger, heartier side, but I know some taught by older generations swear they should be appetizer sized. Whichever size you opt to make them, they will be delicious- smaller ones will just yield more, making them perfect for party appetizers of as a side to a larger Holiday meal. 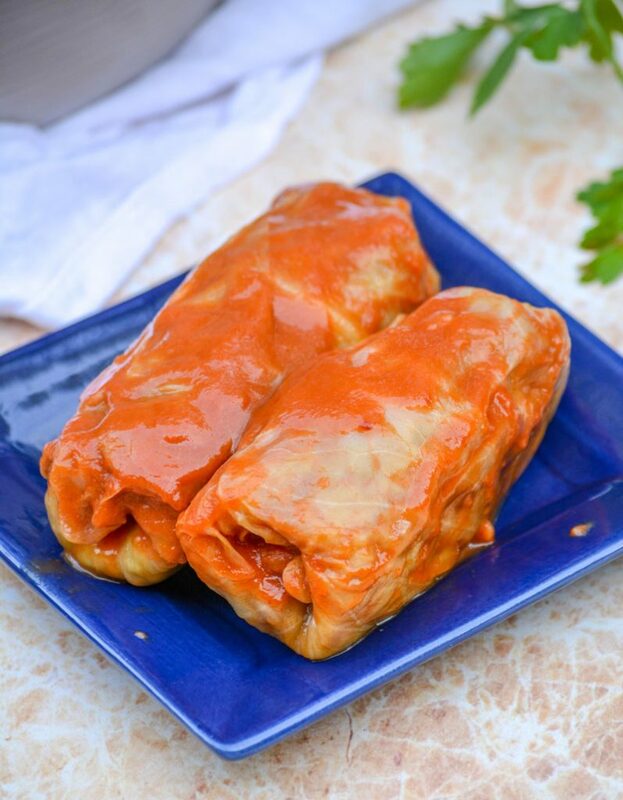 Whether you call them Halupki or Holubki (in different dialects both names transfer to little doves/small pigeons) these stuffed cabbage rolls are a true delight, a recipe destined to be handed down with tasty kitchen memories for future generations. 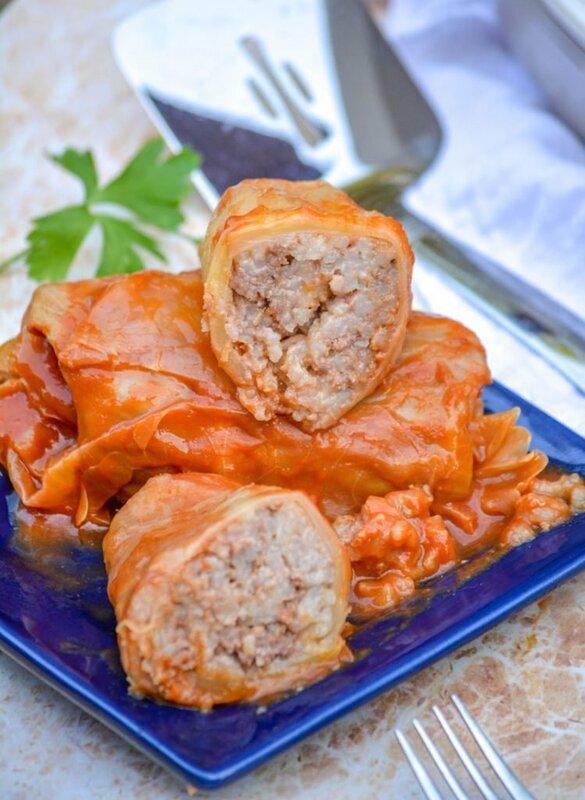 My family's traditional recipe for Slovakian stuffed cabbage leaves, called Halupki or Halubki, features a delicious mixture of seasoned ground beef, onions, and rice rolled into boiled cabbage leaves and baked in a sweetened tomato based sauce. Boil the cabbage for 8-10 minutes, until the leaves are soft and pliable, but not falling apart. Remove the cabbage from the water and allow it to rest and cool. To a large mixing bowl, add the beef, sausage, onions, eggs, garlic powder, salt, pepper, and rice. Using your hands, just like with a good ol' fashioned meatloaf, mix and knead the ingredients together until everything's completely incorporated. Carefully separate and pull off the cabbage leaves, avoiding tearing or ripping them. Working with one leaf at a time, add a nice scoop of the meat & rice mixture. 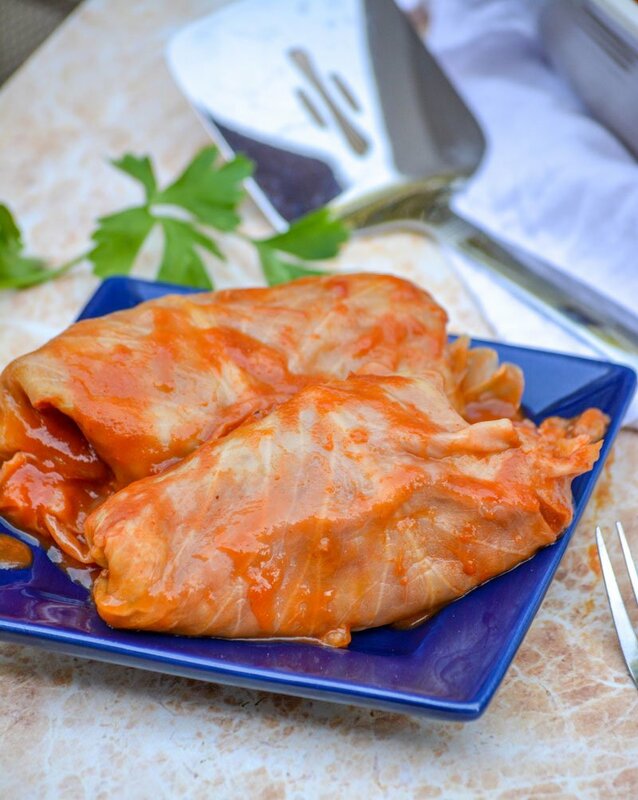 Fold the sides in to create a pocket, and then roll the rest of the cabbage roll up like a burrito, setting it aside- seam side down. In a large casserole dish, add one can of tomato soup. Spread it out to evenly cover the bottom of the dish. Nestle the Halupki into the dish in a single layer. Pour the remaining can of soup evenly out overtop of the cabbage rolls. Cover the dish, either with a lid or tightly with tin foil, and bake at 350 degrees for 40 minutes. Remove the dish from the oven. Uncover, and let rest for 5 minutes before ladling them onto serving plates. Spoon a bit of the tomatoes sauce overtop just before serving. 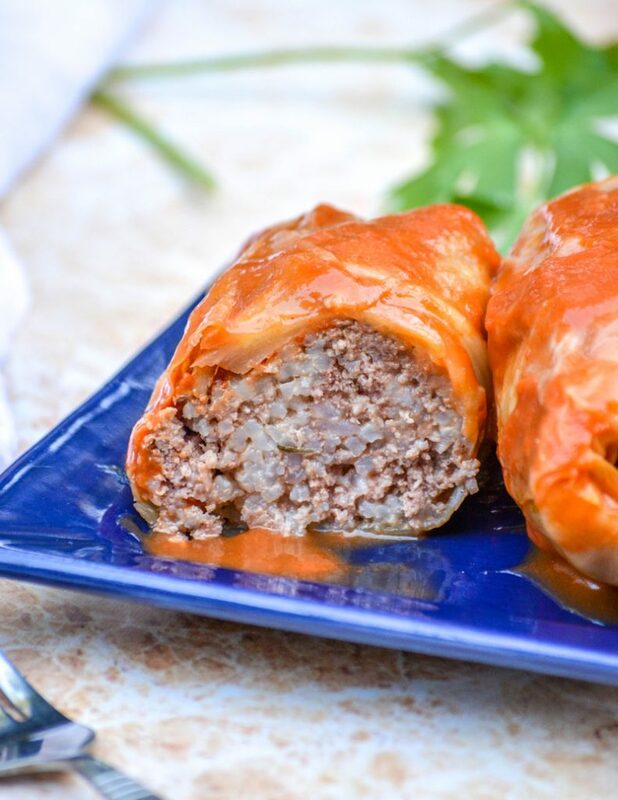 I’ve been making a version of stuffed cabbage rolls a long time. Mine is a WW version and uses turkey and no sausage. Unbelievable it is one of my most popular recipes. These are always good and I would like to kick mine up a notch with some sausage. Thanks for bringing comfort food to Fiesta Friday #250.